Surfer rides monster wave caused by British storm front - Telegraph: "Benjamin Sanchis looks like an ant on the face of the 60ft wave at Belharra in the Bay of Biscay. Frozen in time, the picture shows the lip of the wave lurching forward threatening to crush the Frenchman with hundreds of tons of water. 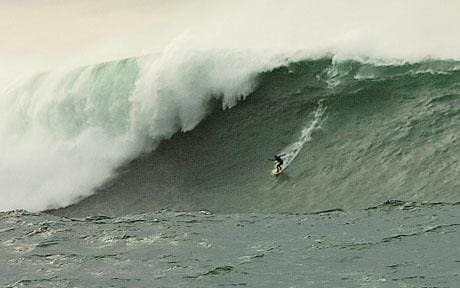 But the 29-year-old professional surfer managed to avoid wiping-out and could earn a place in the history books for the ride."